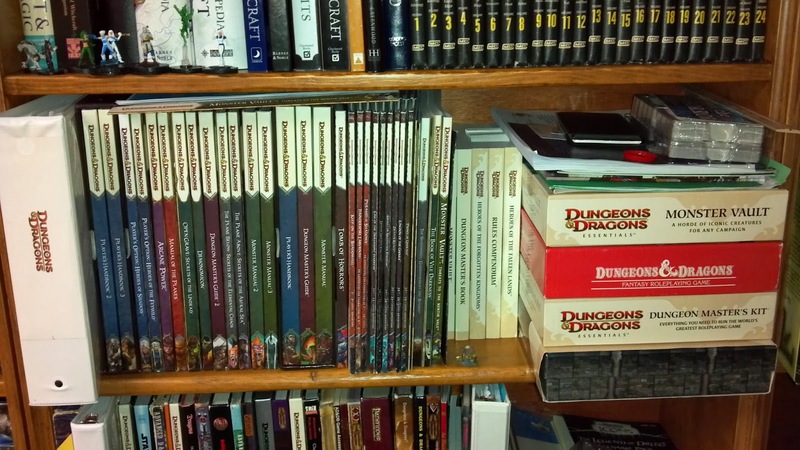 2013 will go down, at least for me, as the year Fourth Edition of Dungeons & Dragons died. It was an ignoble death. When 1st ed gave way for 2nd ed there was a feeling of renewal mixed with an attitude of it was a change for the better. When 2nd ed was replaced by 3e there was a feeling (again in my mind) of a reboot, a new era. 4e always started out on the wrong foot. Many complained it was too video game like, albeit from many that had never actually played it. Others complained it was too soon (though it was shown that we do get a new edition every 8 years or so). We are now all gearing up for D&D Next and I hope that they don't end up calling it that. What will 6e be called? D&D The Next one after that? There is a lot to like about D&D Next and I am looking forward to it. But I can't help but feel a bit of remorse for the loss of my D&D4 game. I will not lie. I had fun with 4e. I loved the books and the fluff and I *will* be recycling as much as I can for whatever I do next. Whether that is Next or even Pathfinder. I did pick up 13th Age which was described to me as a "4e Retro-clone" . It's not exactly that, but there are some really nice ideas in this to bring 4e closer to 3e and it addresses some of the complaints I have heard about 4e. While 4th Ed might be retreating to the back of my gaming list I am not done with it. There are few things I wrote for myself for 4e that are going to see the light of day under different systems. I had created a number of new Warlock pacts that I would love to expand on and even some materials I wrote for a Witch class before WotC published their own. So it is not good bye really. Besides I can still use all those minis, tiles and monster tokens. I had some issues with 4E but overall I had a lot of fun playing it. Theoretically I'm going to start running a 4E game soon. I'm thinking about picking up The 13th Age. It sounds interesting. You know, for all the blather I too had a good time playing it for many years, and could see picking it up again, especially if I do want just a fun, more action and less character-driven game. 4e is a funny beast and I think in time it will redevelop a following of some kind. It really wasn't a bad game. Pretty much everyone else stayed with some combination of 3.5 and Pathfinder. If those figures are anywhere close to accurate outside my little niche its little wonder that the new edition is back to basics. I don't think 4e was that bad myself I read the books and they seemed well thought out and I liked the art. Also 4e had the best cosmology IMO since Planescape, maybe better for my play style. I really like what 4e did for standardizing encounter design, downsizing "quadratic wizards," and making GP/XP/magic rewards scale properly. I would really like to see the "Great Wheel" adapted to fit more in line with the 4e cosmology, since it doesn't require a set of encyclopedias to comprehend, but is somewhat dry in comparison. 6e will be D&D Subsequent, of course! Then don't let it die. "What will 6e be called?" 4e would have fared better had it not been called Dungeons and Dragons 4th edition. @Greg. I remember standing in line with you for this too. Still though I had fun with it. To me, 4th ed should have stayed with it's SF origins, rather than go down in the dungeons with fantasy. I was talking to a guy in the FLGS, who hated 4th with a passion. I asked him what if they used the system for a G.I.Joe or Transformers game (both Hasbro properties), and he said "That would be Awesome!!!" A dungeon crawler game needs to work well in confined spaces. It is part of the way people expect D&D to play. 4th, however, needs lots of open space, to allow characters to use there maneuver, push, pull, and 'port powers. This is much better suited to a combat skirmish game. The limited skill set also made a drag on fantasy play. One of the things that differs between Fantasy and SF/Modern gaming is the emphasis on skills. Today, to operate a phone, TV, computer, or any number of things requires the use of one skill (computers), yet just 30 or 40 years ago, they would have each been a different skill. The farther back you go in Technology, the more important it is to have a broader skill set, to reflect the limits of the spread of knowledge, and how specialized the individuals are. In fantasy, skills need to be special, and important. 4th made them generic and of little importance. All it would have taken, and still could by the way, was one good SF/Modern game to make the system shine again. As for the money sink, yes. I so wish I had skipped a few of the 4th ed books, and spent the money on Pathfinder. I can't say I'll miss 4th. I did run and play it but it never clicked for me as an RPG. When I stepped back and said, "this does not and was not designed to meet the expectations you have when you hear D&D* so look at it as just a game your friend wants you to try," I had a much better experience. As a kind of alternate take on mini's wargaming circa 1970 combined with a board I liked it a lot. It seemed to me a great meld of the ideas in a lot of products from "Two Hour Wargames" with something like Descent (which I really didn't like the one time I played it) or the old HeroQuest. As a game in that space I love it. Sadly, it has something even worse than the need for minis to keep me away (the big issue with the THW stuff): it seemed to me like I really needed the subscription to the tools. I hated going online and loosing access if I lapsed. If they'd let me download and then keep me from getting updates but keep the stuff I had that would have been fine. One thing I did like in 4th was the fluff and I'm looking to fill out a few books. I especially liked its conception of power sources and the planes. Combining both with some ideas in a Sorcerer supplement about magic weapons (whose name escapes me right this second) lead to a campaign idea I still want to run. Looking back I don't think 4th had a chance. It was too different from earlier iterations to do well after its initial thrust. If the OGL hadn't allowed a direct "prior edition" competitor in Pathfinder it might have done alright but D&D Next seems to be reinforcing my believe that it was just too different to be the next D&D even if it was a good game. * In my defense they were built over 30+ years prior to it coming out.